It is heartening to embark on this new era. We wish the Lord’s richest blessings on Russell and Shannon as they carry out this important position. MACGREGOR, Man.—Sunday, Sept. 11, 2017, was an important date in the life of the MacGregor EM Church. 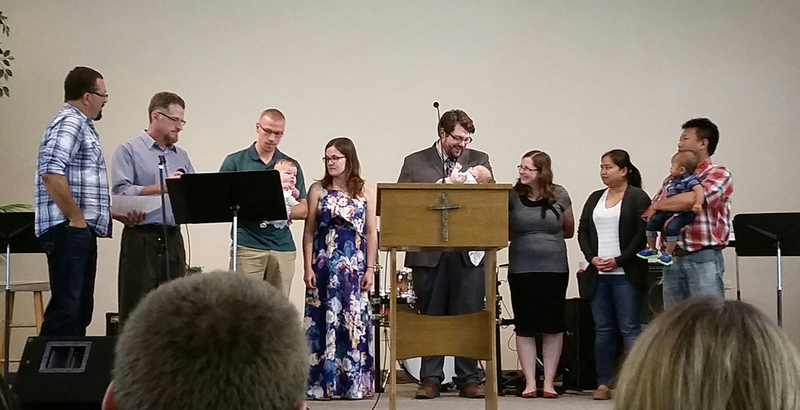 On this morning, a dedication service was held for three babies: Austyn Guenther, daughter of Linden and Dakotah Guenther; Noelle Doerksen, daughter of Russell and Shannon Doerksen; and Tyler Sae-Phan, son of Chai and Bo Sae-Phan. The parents committed to raising their children in the nurture and admonition of the Lord, and the congregation committed to supporting them in that role. It was also an important date as we installed Russell Doerksen as our new pastor and commissioned him and Shannon in their roles of leadership in the church. Russell and Shannon were previously living in Otterburne, Man., where Russell was working for Providence University College and Seminary. They attended Fort Gary EMC in Winnipeg. Conference pastor Layton Friesen brought the message and conducted the installation. “We’re excited to be a part of the community at MacGregor EMC and we’re looking forward to where that leads,” says Russell. After having been without a full-time pastor for a number of years, it is heartening to embark on this new era. We wish the Lord’s richest blessings on Russell and Shannon as they carry out this important position.